BUC’s USED BOAT PRICE GUIDES, a.k.a. “The BUC Book”, has been the used boat pricing "bible" for the boating industry since 1961. It has become the standard reference for current market values of used pleasure boats, yachts, watercraft, motors and trailers of all types and sizes. Using advanced econometric forecasting techniques, BUC’s industry experts derive accurate used boat prices from the correlation of numerous dealer, broker, surveyor and manufacturer reports. How do we determine the boat's book value? We start with hard market data, relying on sales reports from a nationwide network of boat dealers and yacht brokers, covering not just the description and condition of the boat, but a long list of accessory items as well. Taking those reports, we apply a series of formulas that modify the raw numbers, resulting in the listed values that appear in the BUC books. The formulas for each manufacturer, combined with historical data, are then used to adjust the retail prices published in the previous BUC Used Boat Price Guide. Other variables that are factored into each listing include the engine type and size, fuel, and the current economic climate in general as well as the market for luxury items. Unlike other used boat pricing guides, BUC separates the sales reports into seven geographical areas of the U.S. and Canada to more accurately reflect the variances in prices in different locations. Just as in the automobile world, used boat dealers and bankers rely on these used boat pricing books to set their retail prices, to figure trade-in allowances, and to determine the amount of a boat that can be financed. 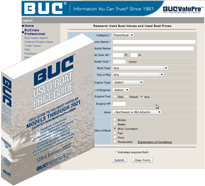 Insurance agents use the BUC Used Boat Price Guide to set the premiums and boat values for their clients, and the Internal Revenue Service and marine surveyors rely on them for guidelines in their evaluations.